Ajit Tamhane is Professor of Industrial Engineering & Management Sciences (IEMS) with a courtesy appointment in Statistics at Northwestern University. 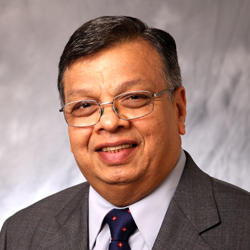 Previously, he was the Chairman of the IEMS Department (2001-2008) and the Senior Associate Dean of the McCormick School of Engineering (2008-2018). He received his BTech degree in Mechanical Engineering from IIT, Bombay, and MS and PhD degrees from Cornell University. Professor Tamhane’s research interests are in the areas of multiple testing problems in clinical trials and design of experiments. He has published over 100 papers in top refereed journals in these and other areas. He is the author of three books: Multiple Comparison Procedures with Yosef Hochberg (Wiley, 1987), Statistics and Data Analysis: From Elementary to Intermediate with Dorothy Dunlop (Prentice Hall, 2000) and Statistical Analysis of Designed Experiments (Wiley, 2009), with a fourth book on the way: Predictive Analytics I: Parametric Models for Regression and Classification, to be published by Wiley in 2019. He is the co-editor of two volumes of collected papers: Design of Experiments: Ranking and Selection with Thomas Santner (Marcel-Dekker, 1984) and Multiple Testing Problems in Pharmaceutical Statistics with Alex Dmitrienko and Frank Bretz (Taylor & Francis, 2009). He is an elected fellow of the American Statistical Association (1991), the Institute of Mathematical Statistics (2010), the American Association for Advancement of Science (2013) and an elected member of the International Statistical Institute (2015). He received the Distinguished Alumnus Award from IIT, Bombay in 2017. My research is focused on statistical multiple testing procedures to address the problems of multiplicity that arise in clinical trials and other medical studies. I am also interested in design of experiments and statistical inference problems.